1. 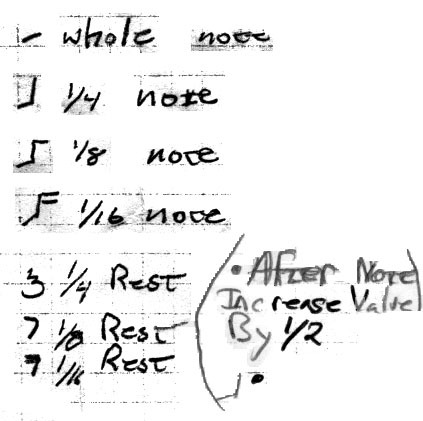 Handedness: As you read left to right across the staff (the horizontal line the notes rest on), the notes above the staff are left hand, and the ones below are right. This should make sense. Tilt your head right so as to read the staff up the page, and the notes to the left are the left hand, and the ones on the right of the staff are right hand. 2. Techniques: In the two pics above, the left hand example is a bass note because it is filled. The right hand example is a tone because it is empty. 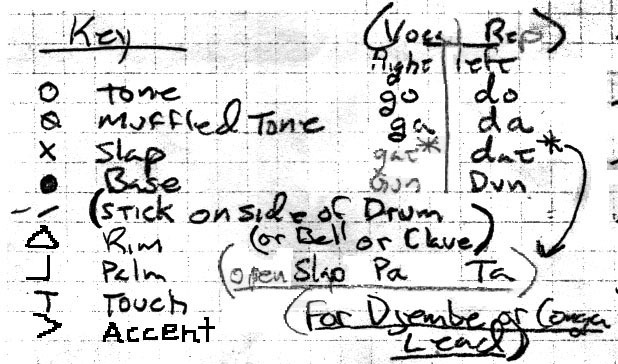 A muffled tone would have one diagonal line through it, and a slap would have two forming an X in the note. The other fairly commonly used identifier is the T which is a touch. The pic below illustrates all of the symbols and their associated sounds. 3. The timing signature for each piece will appear at the top left of each song page. They are generally in 4/4 or 6/8. Within each measure, the notes are assumed to be a quarter or eighth note since this is percussion. However, to insure that the musician understands when notes are “swung”, or to increase awareness off the tempo and feel, flags and rests are used. These are generally the same as found in Classical Western notation. The pic below illustrates all of the rests and flags.